The territories of the "Sacrum Imperium Romanum", with less clarity referred to as Germany and Austria, could be divided into Thaler-, Gulden- and Marck-Regions. The pattern was certainly more complex than the distribution of religions. Gulden were prominent in the south, Thaler had become prominent in territories in the middle, the north and the northwest. Hamburg, Lübeck, Bremen and Berlin issued – different – Marcks and were dominated by the surrounding Thaler regions. While the basic currencies remained stable in their correlation – and to a good extent in their international exchange rates – an immense chaos and instability reigned underneath the broad pattern. Coins issued by regional authorities continuously changed their values. Some places had coherent systems of their own minted coins, others shared the coins of neighbouring territories. Through all the territories merchants spread their different coins. Local authorities advised their citizens at what rates they should accept coins minted elsewhere. The following page will after a few introductory remarks on the three major currencies turn to local situations. 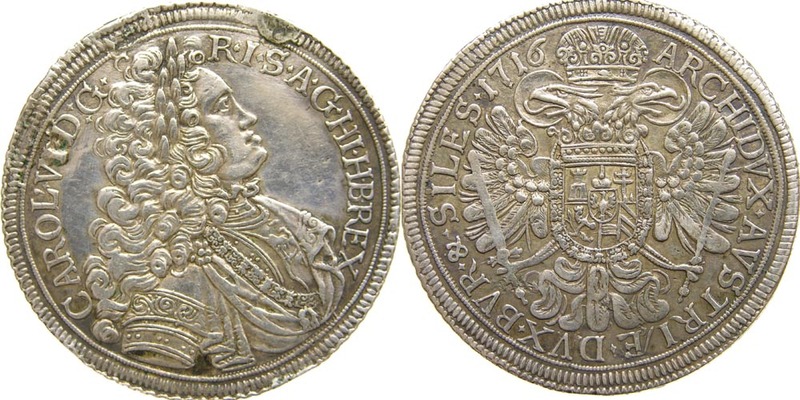 It will conclude with a list of all those special coins accepted in Franconia at the beginning of the 18th century as evaluated at a mint convent in Nürnberg in 1709 — which will not give the complete picture but a central European perspective on the complex situation at the given moment in history. The whole file is so far basically a digest of the information offered by Georg Heinrich Paritius in his Cambio Mercatorio (1709). Reichs-Gulden were the fundamental currency of accounting in southern Germany – other regions issued Gulden as well, yet calculated in Reichsthalers. The usual subdivision was based on the Kreutzer. The system was current with the Rheinischer Gulden being the most frequent Gulden-coin. A Gulden was divided into 15 Batzen, 20 Kaiser-Groschen, 60 Kreutzer or 240 Pfennige. Prominent coins were the Halber Gulden of 30 Kreutzer, the Kopfstück (Head-piece) of 20 Kreutzer, the Ort (Fünffzehner) of 15 Kreutzer, the Sechser of 6 Kreutzer, the Halber Ort (half Ort), the Zweyfache Landmüntze (double country coin) of Fünffer of 5 Kreutzer, the Batzen (4 Kreutzer), the Kayser-Groschen (Imperial grosh) of 3 Kreutzer, the Einfache (simple) Landmüntze (2.5 Kreutzer), the Halber Batzen (half Batzen) of 2 Kreutzer. The Kreutzer (kr.) counted 4 Pfennige, the Pfennig (dl.) 2 Heller. Sums were under this scheme given in Gulden (fl. for florin), Kreutzer (kr. or x.) and Pfennige (d., dl.). Local situations will have to be observed. Hamburg and Lübeck as at 1/3 Reichsthaler. Berlin (as in Denmark) at 1/6 Reichsthaler. Of these three only the first, the "Marck Lübisch" was independent enough to stand as a unit of accounting. All three Marck-regions had otherwise introduced the Reichsthaler as the more common unit of accounting. Along the coast the "pond Vlaams" — the "Flämmische Pfunde" with its "Flämmische Groten" — served in addition as a medium of reference – a feigned currency, eine "fingierte Müntze" so the contemporary terminology. The Reichsthaler was by the imperial decree of 1566 a coin of 29.23 g silver (889/1000 fineness) with a silverweight of 25.98 g. Thaler minted according to this decree till 1750 were called "Speciesthaler", whereas as a Reichsthaler currency unit was fixed at 3/4 of the Reichsthaler species – a regulation causing infinite confusion. The Reichsthaler currency unit (of 3/4 of the Reichsthaler minted) made a career as a European standard useful wherever money was to be transferred via bills of exchange. Stockholm, Copenhagen, Antwerp and Amsterdam adopted the unit - rijksdaalders and rigsdalers and Reichsthaler had the same value. "Species Thaler" or "gemünzte (coined) Thaler" actually circulated as coins whereas the "Reichsthaler" our conversion tools refer to are the pure currency unit of account used to quote prices or yearly incomes – or exchange rates. The confusion was increased by the circulation of coins such as Brabant's Pattacon which actually matched the international currency unit and which were hence called rijksdaalder coins in Dutch and on the international market. Isaac Newton, master of the Royal Mint in London confessed his confusion about these intricacies caused by the coincidence of words when he was asked to determined the value of the international currency preparing official payments to Sweden to be performed in Rigsdalers - Germany's coins of that name were, Newton stated, above the internationally accepted value of the coin. The Reichs-Ducat was the most prominent among the gold-based coins. Its value had to be fixed again and again against the silver-based coins and major currency units. The same problem arose for the individual minted subdivisions and their values against the three units of accounting. Cologne's Albus thus gradually fell from 80 Albus the Reichsthaler in 1680 to 100 Albus around 1700 and 104 in 1728 and so on. The following sections will turn to local situations and they will remain focused on the years 1700-1710 to allow (if successful) the coherent picture within the wider context of Europe's currencies at the beginning of the 18th century. Munich's citizens calculated with Gulden, Kreutzer and Pfennige. Bavarian tax-authorities, however, still dealt with "schwartze Müntze" (black coins). One Pfund Pfennige meant 240 schwartze (black) Pfennige and had the value of one Gulden and a Schilling. The Gulden was divided into 7 Schillinge, 28 Groschen, 84 Regensburger or 210 schwartze Pfennige; the Schilling into 30 Pfennige, the Groschen into 3 Regensburger, one Regensburger matched 5 Heller. The Reichsthaler was divided into 6 Marck of Berlin, into 30 Stempel or 90 Schillinge (the Schilling matching the Rheinische Kreutzer). The subdivisions were: 1 Marck = 5 Stempel, 1 Dutgen = 6 Schillinge, 1 Stempel = 3 Schillinge, 1 Schilling (ß.) = 2 Witt. Coins issued in Braunschweig circulated in Lüneburg, Hannover and the territories united under Hannover's rule down to Münden between Kassel and Göttingen. Sums were given in Thaler, Mariengroschen and Pfennige. One Thaler had 36 Mariengroschen, 1 Mariengroschen had 8 Pfennige (dl.). Calculations were performed in Reichsthaler, Groten and Schwaren even though Bremen issued its own Marck — a Marck of greater value than the Marck Lübisch used in Hamburglink and Lübeck.link Coins of Bremen's valuta were valid in Quedlinburg, Oldenburg/Altenburg, Westfalen and the connected territories. One Thaler divided into 2 Bremische Marck (or 6 Kopff-Stück or 72 Grot). One Mark Bremisch had 36 Grot, 1 Kopff-Stück 12 Grot, the Grot of 5 Schwaren. Accounts were given in Reishthaler (rthl. ), Albus (alb.) and Heller (hl.). The Reichs-Ducat gold coin had (around 1700) a value of 2 Reichsthaler, 56 Albus, 8 Heller. A Thaler of Cologne matched 1.5 Reichsthaler, a Bergischer Thaler 1 1/3 Reichsthaler. The Reichsthaler dicided into 100 Albus, the Albus into two Schillinge, the Schilling (ßl.) into 6 Heller. The value of the Albus had been subjected to a constant decline: in 1534 the Thaler stood at 37 Albus, in 1549 at 48 Albus, from 1560-1589 at 52 or at times at 56 Albus, in 1611 at 75 Albus, from 1690-1727 at 100 Albus, from 1728-1731 at 104 Albus. Equally unstable was due to changes in the gold/silver evaluation and due to the decline of the Albus the evaluation of the Reichs-Ducat. From 1700 to 1706 it was officially set at 2 rthl., 53 alb and 4 hl. From 1707 to 1732 it was fixed at 2 rthl., 56 alb., 8 hl. Cf. Rainer Metz, Geld, Währung und Preisentwicklung: der Niederrheinraum im europäischen Vergleich, 1350-1800 (Frankfurt am Main, 1990), p.392-98. Accounts were held in Reichsthalern or preferably in Gulden. The Reichsthaler was divided into 20 Groschen or Schillinge, the Gulden into 15 Batzen with one Kopfstück matching 4 Batzen. One Batzen (Bl.) had 16 Pfennige, one Groschen or Schilling had 12 Pfennige. The Reichsthaler had 30 Schillinge or 90 Kreutzer, the Reichs-Gulden 20 Schillinge or 60 Kreutzer. The Schilling was divided into 3 Kreutzer, the Kreutzer (kr.) into 4 Pfennige. Lübeck and Hamburg shared the Lübische Marck. Sums were either given in Thaler, Mark, Lübische Schillinge and Pfennige or only in the latter three coins. A second currency interefered as an international standard of reference: The "Flemmische Pfund" with its 240 Groten Flämmisch matching the pond Vlaams of Brabant,link and serving as a "fingirte Müntze, that is without any coins actaully afforded. A Pfund Flämmisch had 20 Schilling Flämmisch and 240 Groten Flämmisch - the regular account of the pond Vlaams and matched 2.5 Reichsthaler. The Reichsthaler was divided into 3 Marck (or 8 Schillinge Flämmisch or 48 Schillinge Lübisch). The Marck Lübisch (M.) had 16 Schillinge Lübisch. One Schilling Flämmisch made 6 Schillinge Lübisch, and one Schilling Lübisch (ß.) 2 Groten Flämmisch or 12 Pfennige. 1 Grot Flämmisch circulated with the "Seßling" a coin of 6 Pfennige Lübisch. Lüneburg had a "Lüneburger Gulden" of greater value than the Reichs-Gulden: The Reichs-Gulden was worth two thirds of Reichsthaler, the Lüneburger Gulden, however, three quarters. The system was mixed with Gulden and Schillinge belonging together and with the Reichsthaler being subdivided into Marien-Groschen and Pfenninge as in Braunschweig. One Reichsthaler (Rthl.) was divided into 64 Schillinge (or 36 Marien-Groschen or 288 Pfennige). The Marien-Groschen was divided into 8 Pfennige, the Schilling made accordingly 4.5 Pfennige. The Sächsisch/Meißnische coin was used in Leipzig, Naumburg and the territories of Saxonia and Meißen. Note: 60 Groschen could be referred to as 1 "Schock". One Reichsthaler had 24 gute Groschen (good groshs), one guter Groschen ([g]gr. or [g]gl.) had 12 gute Pfennige. The Reichsthaler was divided into 30 Kayser-Groschen or 90 Schillinge or 120 Gröschel. A Kayser-Groschen (Krgl.) was divided into 3 Schillinge or 4 Gröschel. A Weißgröschel (silver grosh) into 2 Schillinge. The territory reached up to Königsau and Koldeingfjord, that is up to the line Ribe-Kolding, far into modern Denmark. Alternative subdivisions seem to have ben in use. A: The Lübische Mark at 4 Ort, 16 Düttchen, 96 Sechslinge, B: a system with the Mark Lübisch at 16 Schilling, the Schilling at 12 Pfennige, and C: a system with the Mark at 16 Schillinge, 48 Witten, 96 Blaffert, 192 Pfennige or 348 Scherf respectively. System C. would be the Danishlink system. We shall offer more clarity as soon as we get better expertise on these systems. The Reichsthaler matched 90 Kreutzer Rheinisch, The Rheinischer Gulden 10 Straßburger Schillinge or 60 Rheinische Kreutzer. A Schilling matched under this equation 6 Rheinische Kreutzer or 12 Straßburger Pfennige. One Straßburger Pfennig had 2 Straßburger Heller. The Reichsthalerwas divided into 30 Groschen or Schillinge, the Reichs-Gulden into 15 Batzen or 20 Groschen or Schillinge. One Groschen or Schilling made 6 Pfennige, one Pfennig 2 Heller. One Wiener Gulden 8 Schillinge or 20 Kayser-Groschen or 240 Pfennige. The Schilling (ß.) was divide into 30 Pfennige, the Kayser-Groschen into 12 Pfennige. The following will offer the data of the "Renewed Specification of the greater coins as established at the convention which met in Nürnberg Febr. 22. 1709 to determine the value of these coins basing on the rate of the Ducate rated at 4 Imperial Guilders and the Imperial Thaler being 2 Imperial Guilders, as to be accepted or not accepted in commerce and exchange. ", published by G. H. Paritius in 1709. Erneuerte Specification der groben Sorten und wie solche bey dem An. 1709. d. 22. Febr. zu Nürnberg gehaltenen Müntz-Probations-Convent, nach dem Fuß des Ducatens à 4. fl. und des Reichs-Thalers à 2. fl.link im Handel und Wandel mit Ausschliessung anderer, anzunehmen, resolvieret worden. Dann ist auch nachfolgende in denen correspondirenden löblichen dreyen Creysen auf approbirte Müntze Städten ausgeprägte Schied Müntze mit Ausschliessung aller andern, so auf Hecken-Müntzstätten, oder ausser besagten löbl. dreyen Creisen gefertigt, oder sonst von zu geringen Halt befunden worden, in denen darbey gesetzten Preiß durchgehends anzunehmen beliebet. Schön, Gerhard, Deutscher Münzkatalog. 18. Jahrhundert, 3rd rev. ed. (München: Battenberg, 2002). Metz, Rainer, Geld, Währung und Preisentwicklung: der Niederrheinraum im europäischen Vergleich, 1350-1800 (Frankfurt am Main, 1990). Gerhard, Hans-Jürgen (ed. ), Löhne im vor- und frühindustriellen Deutschland. Göttinger Beiträge zur Wirtschafts- und Sozialgeschichte, vol. 7 (Göttingen, 1984). Ebeling, Dietrich/ Irsigler, Franz, Getreideumsatz, Getreide- und Brotpreise in Köln, 1368-1797 (Köln, 1976). This page was last modified 18:48, 3 April 2008. This page has been accessed 74,783 times.